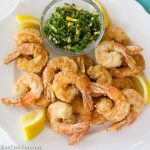 Easy Fried Shrimp takes 3 ingredients and 3 minutes to cook and is delicious! I experimented frying shrimp with a tempura batter, a breadcrumb coating, and a simple flour coating. The hands down winner was the simple flour coating! The simple coating allows the shrimp to be the star! Add salt and lots of black pepper for seasoning. It is also easiest to make! The essence of Italian cuisine is all about simplicity and quality ingredients. My Easy Fried Shrimp or Gamberi Fritti is a great example of this. I used the same recipe as Fritto Miso (Fried Mix), a mix of fried seafood such as calamari (squid), shrimp with heads, scallops, and clams that is often served at Italian eateries. Since all I had in my freezer was a bag of shrimp from Costco, I went with just headless shrimp. We were able to sit down to a wonderful lunch on a Sunday afternoon in 30 minutes from start to finish. That included thawing the shrimp in water, heating the deep fryer, and uncorking a wonderful bottle of Pinot Grigot. 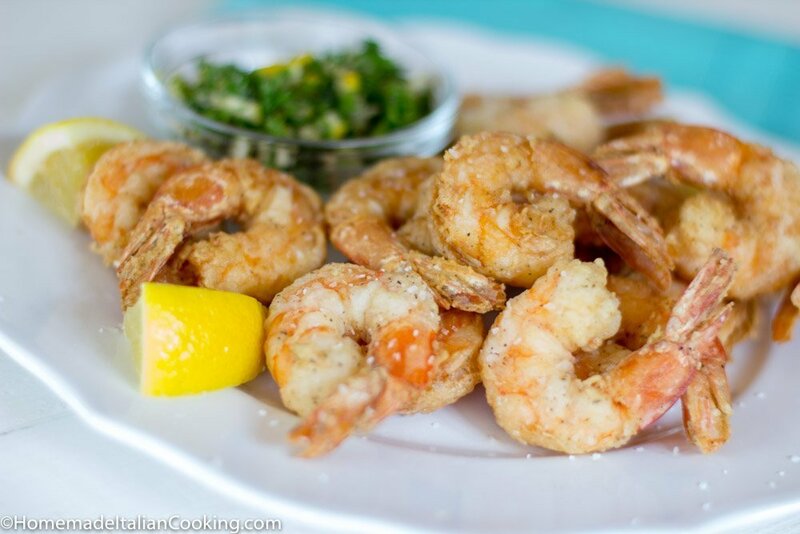 I served the shrimp with a quick Gremolata of minced lemon, parsley and garlic on the side. My husband prefers cocktail sauce. The recipe is so easy! Coat the shrimp in the flour, salt and pepper. Fry for 3 minutes at 370 degrees. Have a rack and paper towels ready for draining. The results is a light and crispy perfectly fried shrimp. Serve hot with lemon edges and favorite condiment. Be sure to makes lots of them because they will go fast. The hardest part is getting out the deep fryer and cleaning it afterwards. Easy Fried Shrimp is so delicious it is worth it! I’m hoping to get a new deep fryer this year since mine is so old. This is the one I want from Amazon! It filters the oil and makes clean up a breeze! 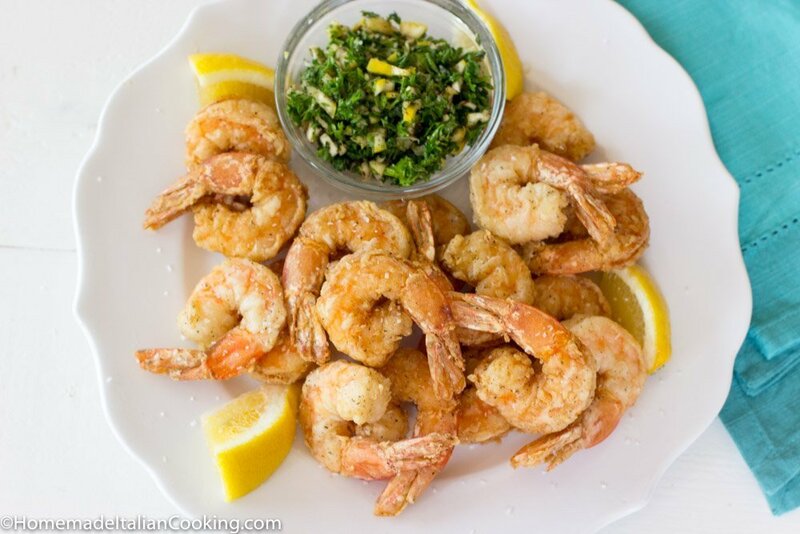 Easy Fried Shrimp takes 3 ingredients and 3 minutes to cook! This recipe is delicious! I experimented frying the shrimp with both a tempura batter, a breadcrumb coating, and a simple flour coating. The hands down winner was the simple flour coating! The simple coating allowed the shrimp to be the star! Add salt and lots of black pepper for seasoning. It is also easiest to make! Preheat the deep fryer to 370 degrees. 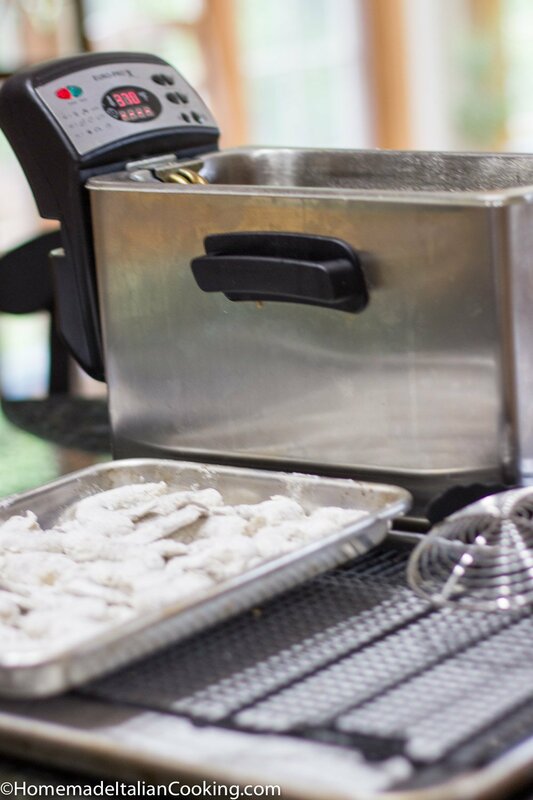 Prepare a baking sheet lined with a rack and paper towels underneath for draining the fried shrimp. Assemble dipping sauces and serving platters so they can be served immediately. In a large bowl, mix the flour, salt and black and red peppers. Add the clean, dry shrimp to the flour. Gently toss the shrimp with your hands until coated evenly. 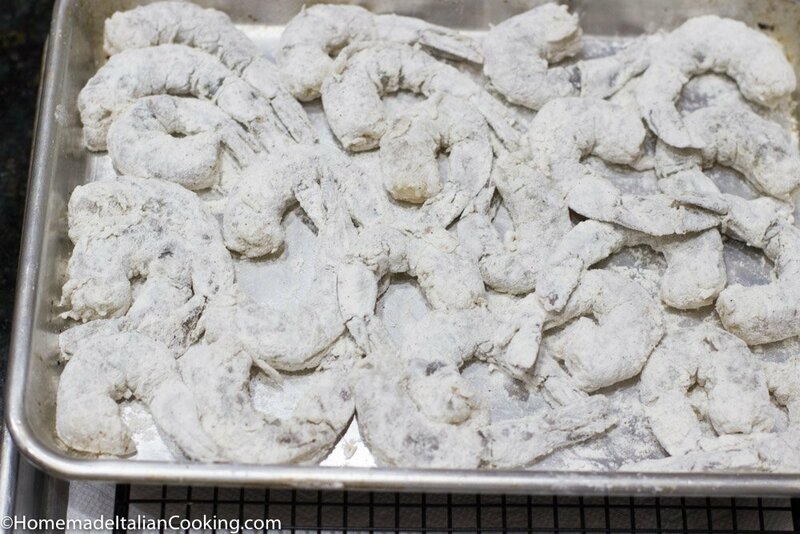 Remove the shrimp, shake off any excess and lay on a tray platter ready to fry. Add about 6 shrimp at a time to the hot oil. Do not overcrowd the fryer. It should bubble and squeak. Cook for 2 - 3 minutes until lightly golden. Do not overcook. Remove the fried shrimp and place on the rack to drain. Fry the shrimp in small batches being sure the oil is at temperature before frying each batch. Bonus condiment: Lemon, Garlic & Parsley Gremolata: Mix handful minced parsley, ¼ lemon minced with peel, 1 clove garlic minced, a pinch of salt and pepper and a dash of olive oil. Sprinkle over hot shrimp. This is confirmation of the simple recipe I have been looking for. My grandmother fried shrimp this way.it is the best! The Gremolata is a good suggestion. Thank you for the comment! It really is simple and delicious. My husband craves them, and dips them in cocktail sauce.